Have a GSD and have been taping ears. Have the tape on for 1 week at a time. The ears then are both up for a week or so. Then one will flop or fall, I then retape that ear or both. Have taped the ears 3 times now. One day one will be straight the other floppy, then the next day the other one is up and vise versa. She will be 7 months in another week and a half. What is going on? Total German Shepherd: This is fairly common in developing German Shepherd puppies however at this late stage in your German Shepherd puppies development her ears may not come up on their own completely - sometimes they just don't. And usually around 7 to 8 months seems to be the cut off point for many GSDs. The taping is a good idea however and I would encourage you to continue this for a while longer since at this point it can't hurt your German Shepherd puppy and it can only help to train those developing ear muscles. You can read more about German Shepherd ear taping and more information about those developing ears and why they do what they do in our website at Total German Shepherd. And if her ears just don't come up on their own, it's not the end of the world. 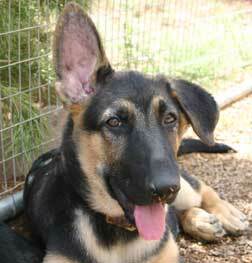 Ear carriage doesn't affect her ability to be a pet and a great companion - enjoy your German Shepherds uniqueness.